Will there be a new Porsche 928 based on the Panamera? Not in the near future there won't but look back to 2009 and a new 928 was talked about in several publications. "Reborn Porsche 928 is fronting up! Get ready for a blast from Porsche’s past! The German firm is developing a luxurious, front-engined grand tourer – a spiritual successor to the 928 built between 1977 and 1995. The ‘new 928’ will be a fifth model line, and is designed to sit above the sportier 911 in the range." "The 928 will slot into Porsche’s pricing line-up somewhere between the 911 and Panamera. The four-door ranges from £70,000-£95,000, while the 911 starts a little lower, at just over £60,000, but stretches to £128,000 for the GT2. With this is mind, expect the 928 to be pitched between £65,000 and £90,000 – enough to safely undercut its Ferrari and Aston rivals when it goes on sale in 2012." Auto Express weren't the only ones to think a front engined Porsche GT was on its way. Autocar produced a horrendous looking render, Top Speed produced their own awful render a few months later and even Car And Driver were fooled. 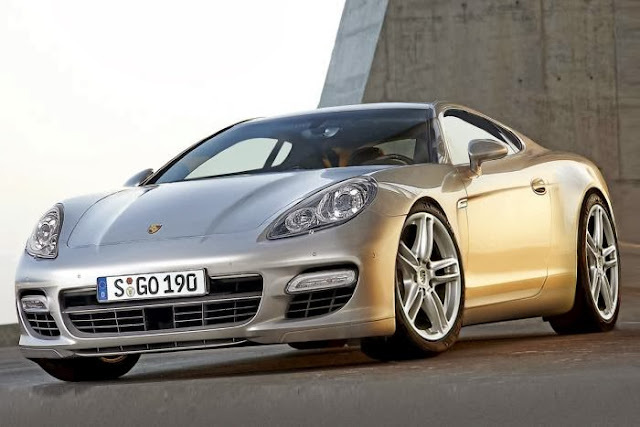 If you think about it it would be quite straightforward for Porsche to create a new 928 based on the Panamera and with V8, V6 and hybrid engines taken from its existing model line. Perhaps that's why the motoring press got their knickers in a twist about it and put two and two together and came up with five. "Hey, it would be easy for Porsche to make, so they'll make it for sure - won't they?" But Porsche is a very conservative company who's new products have a long gestation. It also has a tendency to let slip information about new models at early stages. Last year the Porsche Panamera Sports Touring concept was revealed. It's the closest we'll get to a 928 for a long time. You can be sure there is no 928 on the horizon, despite everyone getting excited about it back in 2009.